With most applications, you can sum up what they do in a sentence, but with Quicksilver it's not so easy. Essentially, this program's focus is on accessing and manipulating objects (files, folders, URLs, and so on), primarily via the keyboard, but Quicksilver's huge range of plug-ins make it far more powerful than it first sounds - think of a souped-up Spotlight, where incremental searching also enables you to perform actions on your selection, or navigate files and folders, or access features within some apps. After Quicksilver is invoked (by the user-defined shortcut, [control] [spacebar]), you use incremental searches and/or the arrow keys to find a subject (just like in Spotlight), and then [tab] to move to the next field, where you can assign an action to your selection in the same way. Sometimes a third field is required, if the action provides choices (such as the location of a 'move' action, or the format of a 'compress' action). Press [Enter] to execute a command. To move a file, for example, invoke Quicksilver, type a few characters to bring up the file, hit [tab], press [M] to select Move To..., hit [tab] again, type a few characters to bring up the target destination, and then hit [Enter]. This takes seconds and is quicker than Finder. But there's more: Quicksilver has a drop-stack. Hit [,] after selecting an item and it's added to the stack. Once you're done, the group of items (which can be from various folders) can be moved elsewhere. Alternatively, you can copy them, compress them to a Zip file, and create an email with the Zip file as an attachment - all within Quicksilver's interface. 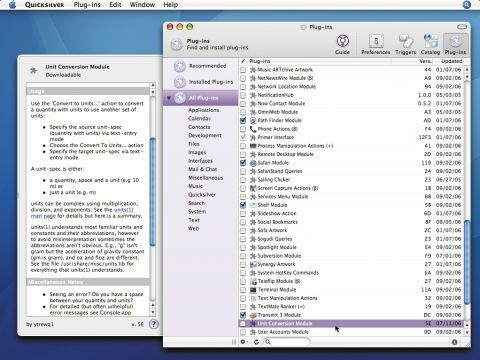 Many other common Mac-based tasks can be sped up considerably when using Quicksilver. Launching apps is a cinch - invoke Quicksilver, start typing the application name, and hit [Enter] (because Open is the default action, you needn't [tab] to the Action field). Elsewhere, when in a Save dialog, invoke Quicksilver, use it to find the target save folder, and drag that folder back to the Save dialog - a quicker process than navigating to a folder in the dialog itself. Not everything in Quicksilver requires incremental searching. Using arrow keys brings up the Browsing window, through which you can navigate your hard drive, or choose actions from a list. Naturally, over time, Quicksilver 'learns' which letters refer to specific items. Some programs have specific browsing options, too - if you select iTunes, you can browse playlists; and selecting Safari enables you to explore your Bookmarks and History. Also, hotkeys can be assigned to user-defined commands, the clipboard can be expanded to house dozens of items (and those can be viewed and manipulated), and plug-ins for various apps - Transmit, Firefox, Mail, and so on - can be added, making it possible to access some of their features and content via Quicksilver. After a few weeks of use, we've found few flaws with it. Sure, the learning curve is steep, and it's easy to dismiss Quicksilver before getting to grips with it. However, perseverance reaps rewards, and we highly recommend reading through the documentation and spending a good few hours experimenting, which should enable you to understand the interface, plug-ins and the way many actions work. Other than the learning curve, the only negative factor is how Quicksilver's 'catalog' is handled. Unlike Spotlight's more-or-less instantaneous updating of what's on your hard drive, Quicksilver typically re-scans every ten minutes (to reduce processor overheads), so accessing recently created items can be a little hit-and-miss.